Stage one of our coop construction is now complete. 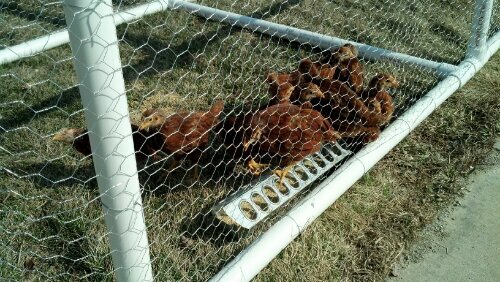 We wanted to get their “playpen” built first so we could start letting them outside for a few hours a day to start scratching and preparing the soil for our plantings. 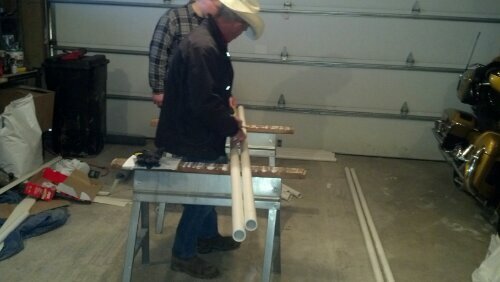 In the beginning, we were going to build the pen out of wood, but then we found a website with detailed instructions on building a PVC pipe pen. 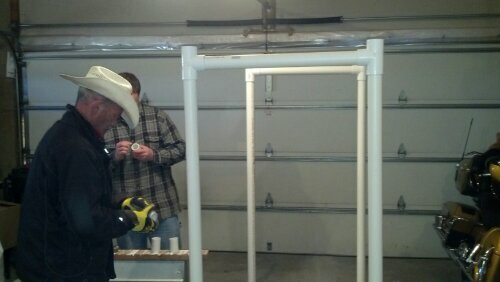 We priced out both wood and PVC and found the cost to be comparable so we opted for the easier route: PVC. 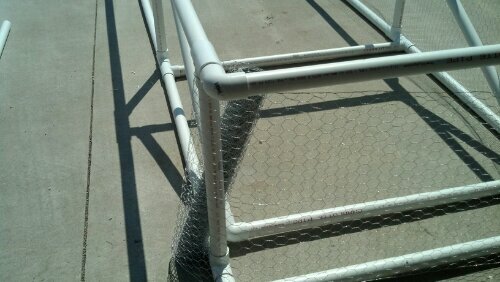 Once the frame was built, Ray’s dad wrapped it with chicken wire while Ray worked on a hinged lid on the top. This will make it easier to move, feed and water the chickens. But once they got used to the ‘freedom’, they started clucking, scratching and pecking. Since we get some wicked wind pretty much year round, Ray put a removable cap on one of the pipes with a drain on another so that we could pump water in to weight it down. 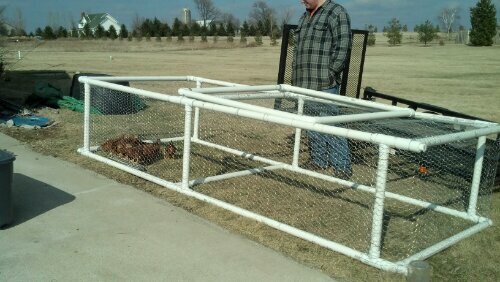 It’s pretty easy to move around and it doesn’t take much to get the chickens to get out of the way. We let them explore their new playpen for a few hours today and then put them back in their box in the garage. It’s supposed to get cold tonight and there is no cover or laying box for them to hide in. 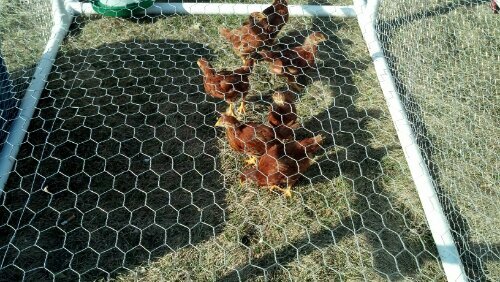 Tomorrow it is supposed to get up in the low 60’s so we’ll let them out again in the afternoon and see how they like it. We’ll put them to work in the vineyard and see how long it takes them to scratch up and fertilize the ground. 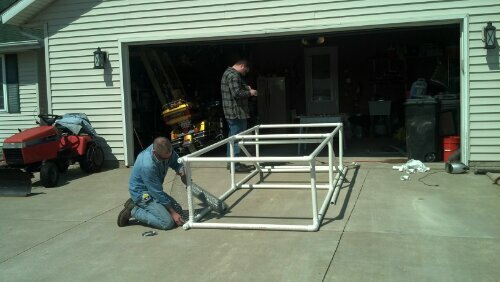 Once we find a trailer, we’ll start on stage 2: the hen house. We also introduced our Pekingese to them and, just as I suspected, his initial aloof attitude was just an act. He ran around and around the pen whimpering with his tail wagging in excitement. We’ll have to watch him with the girls, they could tear him up! 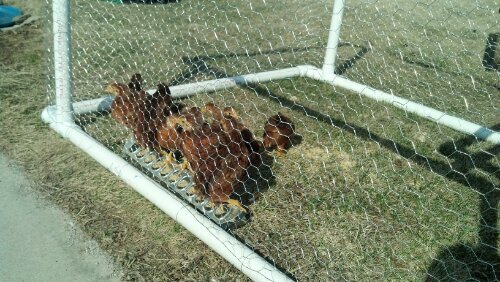 This entry was posted in 13 Skills, Chickens!, Garden Stories, Preparedness. Bookmark the permalink. Neato! But, are you positive they are all girls? No, I’m not. In fact, I’m starting to think that Esther is a boy. Love the PVC pipe idea! We just got done building one out of wood and it is very heavy! We were literally getting ready to go buy the wood when Ray found this idea online. I’m so glad he did! It went together pretty fast. I’d love to see pictures of yours! I will get pictures to you this week! Can’t wait for your Phase 2!